Differential geometry, in the classical sense, is developed through the theory of smooth manifolds. In the early 1990s, the author initiated a new kind of differential geometry in which all the machinary of classical differential geometry can be explained without any notion of smoothness, that enables unexpected potential applicability since anomalies can now be incorporated in the calculations. This was acheived via sheaf theory (geometry) and sheaf cohomology (analysis). 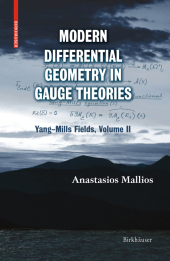 "Modern Differential Geometry in Gauge Theories" is a two volume research monograph, which systematically applies his sheaf-theoretic approach to such physical theories as gauge theory. Continuing his point of view, started in the first volume of this work, the author extends the application of his sheaf-theoretic approach to Yang-Mills fields in general. The important topics include cohomological classification of Yang-Mills fields, the geometry of Yang-Mills A-connections and moduli space of a vector sheaf, as well as Einstein´s equation in vacuum. This text contains a wealth of detailed and rigorous computations, and will appeal to mathematicians and physicists along with advanced undergraduate and graduate students studying applications of differential geometry to physical theories. General Preface.- Preface to Volume II.- Acknowledgments.- Contents of Volume I.- Part II Yang-Mills Theory: General Theory.- 1 Abstract Yang-Mills Theory.- 2 Moduli Spaces of A-Connections of Yang-Mills Fields.- 3 Geometry of Yang-Mills A-Connections.- Part III General Relativity.- 4 General Relativity, as a Gauge Theory. Singularities.- References.- Index of Notation.- Index.